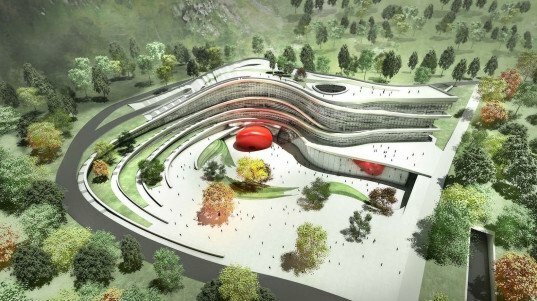 The Fangshan Tangshan National Geopark, located 40 kilometres east of Nanjing, China, is soon to be home to the Great Relic Museum. After winning an international design competition, HASSELL Studios designed the gateway plaza and surrounding parkland for the museum which will connect the new buildings to the geopark's many natural attractions. The park is the site of the HULU caves, in which homo erectus fossils dating to between 160,000 and 600,000 years ago were discovered in 1993. The site also features an ancient quarry exhibiting geological formations of the Palaeozoic era. The rise and curve of the outdoor plaza follows the lines of the site’s topography, creating a harmony between the outdoor and indoor space. A tower in the arrival plaza creates a natural meeting point for visitors, who can then continue their journey into the park via a series of feature gardens. Climbing pathways enhanced with carvings depicting the evolution of prehistoric life draw visitors through the gardens. Each garden is inspired by the environmental characteristics from a single period of the Palaeozoic era, starting with the rocky soil crust of the Cambrian period and moving through to the Silurian wetlands and Carboniferous swamp forest. Each section of the gardens offers its own distinct micro-ecosystem, providing environments that foster a variety of local birds, insects, and other wildlife. A cleansing waterway runs through the park, treating site run-off and supporting the sustainability of the park. The museum plaza is now complete and the wider parkland is to be completed in 2016. 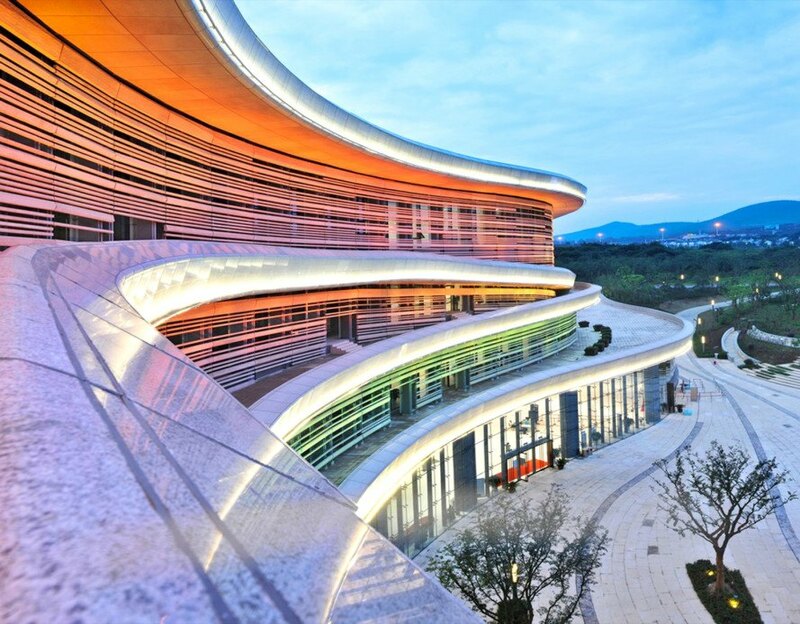 The designers of the Fangshan Tangshan National Geopark's public plaza needed to take into account the site's commercial interests while preserving its historical, natural, and cultural significance. The Great Relic Museum will feature large open spaces and floor-to-ceiling windows to create unity with the outdoor plaza. The rise and curve of the outdoor plaza follows the lines of the site's topography, creating a harmony between the outdoor and indoor space. This architectural drawing shows the naturalistic curves of the museum building and plaza. The varying elevations of the Great Relic Museum building reflect the site's topography. Escalators provide easy access to the several floors of the Great Relic Museum's exhibits. A natural wall features plant-life from various periods of the Palaeozoic era. "Our response celebrates the plaza's gateway status, the museum's architectural form, and the geopark's many extraordinary features," said Andrew Wilkinson, HASSELL Principal in China.